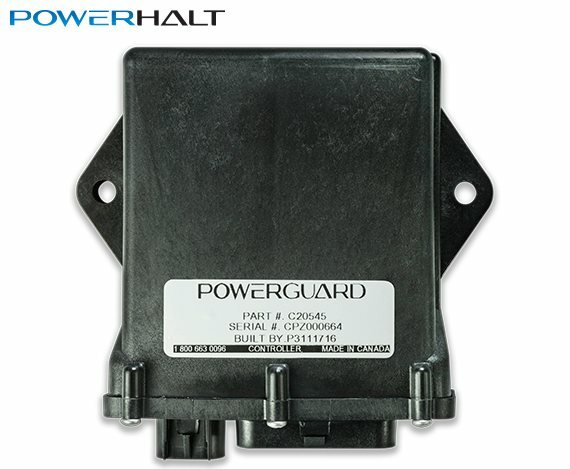 PowerGuard Automatic Control monitors engine speed through a gear tooth sensor mounted to the transmission bell housing using an existing auxiliary port or by the drilling and tapping of a new port. The controller has a programmable trip point – when the programmed pre-set speed is exceeded, emergency engine shutdown will occur automatically. Emergency shutdown can be activated at any time through a manual override button. All control and programming is completed using a membrane switch mounted in a vehicle’s cab or on a control panel. An auxiliary input harness is available to expand systems to utilize external trip input signals or switches.